Boeing successfully flew a Indian Navy-bound P-81 for the first time today as it lifted off from Renton Field at 12:02 P.M. PST. The large aircraft was airborne for two hours, 31 minutes until landing at Boeing Field in Seattle, WA. While in the air it managed to climb to a height ceiling of 41,000 feet. Notable is that company officials stated that it was not yet equipped with mission systems, something which was waiting to be installed after a successful flight. The Indian Navy had the following to say about the Boeing P-81, “The P-8I program is progressing well and we are looking foreward to this potent platform joining the Indian Navy as part of its fleet,” said Rear Adm. DM Sudan, assistant chief of Naval Staff (Air), Indian Navy. 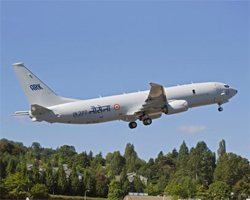 Boeing released the following in a company statement, “The P-8I will provide India with the necessary speed and reliability to satisfy the Indian Navy’s maritime reconnaissance and anti-submarine warfare requirements,” said Dinesh Keskar, Boeing India president. According to Boeing, the P-81 designed for utilization in the Indian Navy is a variant of the P-8A Poseidon that Boeing is in the middle of developing for the United States Navy. Both planes are based on Boeing “Next-Generation” 737 commercial aircraft. The P-81 can be used as a long-range reconnaissance aircraft and in anti-submarine warfare. The construction of the aircraft for the Indian Navy is the result of a contract awarded in January, 2009. Within the contract, there lies an option for the construction of four additional aircraft.